Gwendoline Christie has slowly become one of my biggest inspirations over the past few years. Not only as an actress, but as a woman. I stumbled across a quote one night on tumblr that confirmed my love for her. She said that all her life she wanted to be an actress and all of her life she was rejected time after time for the way she looked. It wasn’t until she was sent the script for Brienne of Tarth that she knew she had finally found a script made just for her, and it was liberating to be exactly what the casting directors wanted for the first time. This is something I madly relate to. Being an actress with an ‘un-generic look’ or ‘interesting face’ as my agent would say, can be tough. The process is long, and the rejections come like no other. I know that one day, a role will crop up that I will fit perfectly, and I thank Gwendoline for giving me the hope to not give up. She graduated from drama school 10 years ago which shows just how long it can take an actor to break the scene. It encourages me to believe even though the road is long, nothing should doubt my goals because everything is achievable with faith and hard work. Now, Gwendoline is part of three franchises (GOT, Star Wars AND The Hunger Games) – living proof that one should never give up on what they love! I wonder how many times she contemplated throwing it all in. But she never did, and now she’s on the verge of world wide status. Not only is she killing it in Hollywood, she’s just fronted the AW15 campaign of my favourite fashion label. 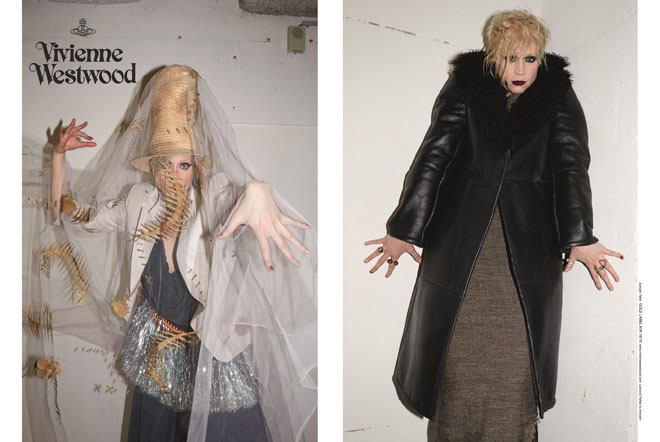 Gwendoline first worked with Vivienne Westwood when she walked in her runway show and since then the rest has been history. In her latest campaign, Gwendoline was shot by Juergen Teller for the VW AW 15 Gold Label. Take a look at the pictures below. Both Vivienne Westwood and Gwendoline Christie had kind words to say about each other in recent interviews. I just love seeing successful women build each other up! I can’t wait to watch Gwendolines career take off and continue to see her inspire many girls like myself all over the world.